General Motors Corp. shares on Friday fell to their lowest point in more than 75 years, as investors fretted that despite government help the ailing automaker may still be forced to file for bankruptcy protection. GM shares hit a low of $1.27 in late morning trading Friday, before rebounding. At the closing bell, GM shares dropped 41 cents, or 22 percent, to $1.45. The low point matched a record set on May 4, 1933, according to the Center for Research in Security Prices at the University of Chicago. The price is adjusted for splits and other changes. GM released a statement Friday saying that it had not changed it position on a possible bankruptcy protection filing, and that an out of court restructuring remains its best option. 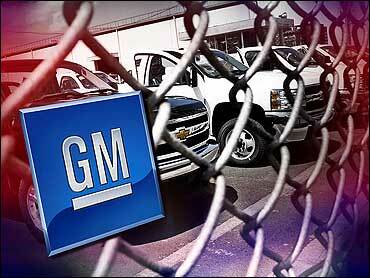 "As a prudent business measure, the company has analyzed various bankruptcy scenarios," GM said in its statement. "However, the company firmly believes an in-court restructuring would carry with it tremendous costs and risks, the most significant being a dramatic deterioration of revenue due to lost sales." Even if the automaker doesn't file for bankruptcy protection, analysts have said that a government bailout of the automaker will also dilute its shares to the point that they are nearly worthless. Friday's stock drop comes as members of the Obama administration's auto task force continue to meet with GM's stakeholders and weigh their options. On Thursday, members of the task force met with representatives of General Motors' bondholders, along with the chief executive of Fiat Group SpA whose company wants to form an alliance with GM's fellow ailing automaker Chrysler LLC. The news came on the same day that Detroit-based GM released its annual report in which its auditors said they had doubts about whether GM can overcome its staggering losses and generate enough cash to stay in business. GM said in the report that it's on the edge of bankruptcy and won't be able to avoid it unless it gets more government money and successfully executes a huge restructuring plan. The automaker lost $30.9 billion last year, is living on $13.4 billion in U.S. government loans, and is seeking up to $30 billion as it tries to survive the worst auto sales climate in 27 years. GM is also hoping to get help from other countries. The automaker's Adam Opel AG subsidiary wants to secure at least $3.8 billion from the German government. Detroit's automakers have 20 plants in Ohio. The biggest include a Chrysler LLC complex that makes Jeeps in Toledo and a General Motors Corp. factory in Lordstown that produces the Cobalt and Pontiac G5 fuel-efficient cars.